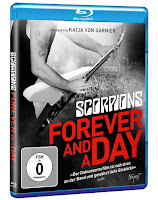 Rock & Metal 4 You: Special: Blu-Ray Review - SCORPIONS "Forever And A Day"
Special: Blu-Ray Review - SCORPIONS "Forever And A Day"
It's been quite a while when I did my latest Blu-Ray review, so I thought it would be cool to do another one. 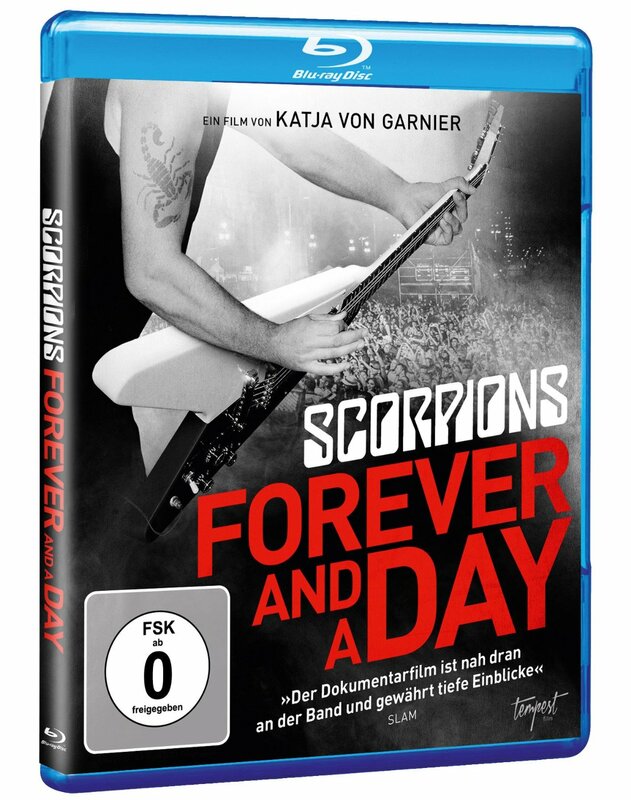 Yesterday I watched the documentary "Forever And A Day", which deals mostly with the farewell tour from Germanys biggest Hard Rock export the Scorpions. The movie was shown in some cinemas in addition to the release of the new album "Return To Forever". If this was a smart move I'll discuss in this review. Back in 2010 "Sting In The Tail" was supposed to be the last record by the Scorpions before they said goodbye to their fans and the music world. A huge farewell tour followed and director Katja von Garnier followed each step of the guys during this tour to capture some material for this documentary. 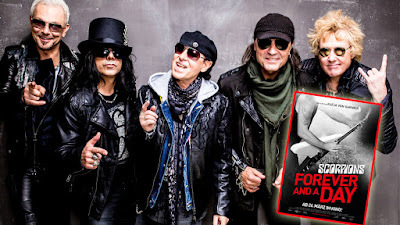 Live- and behind the scenes footage alternates with interviews of old companions (Michail Gorbatschow, Michael Schenker, Paul Stanley, Don Dokken, ...) and the band itself as well as original footage from every important event from various decades. So, the first thing that impressed me very much was the fact that you'll get to know much about the historical background in this film. It's not just about the Scorpions, it's also about what happend in the world and in a certain period of time. What was it like when you tried to attend a concert of a West European band in Russia in the 80's? What was it like to be part of the fall of the Berlin wall? How was life back then and now? What changed during the times when you think of important buildings and all that stuff. So that was a very interesting approach. Next thing I really liked was the honesty in all those interviews. The band also talks about the darker side of the business and how this affected their personal lifes. What does it mean to be on the road for so long? Klaus Meine talks about his marriage, Paweł Mąciwoda about the loss of his mother and much more. So all these little personal stories make these guys very authentic and sympathetic. But for sure the focus lies on how young teenagers followed their dream to become famous all over the world and this is captured very well. To me it was a bit sad that there was no real chronological order. All the important things that happened during 50 years were a bit mixed up. I also asked myself during the whole movie "why do they release this film now"? Why not 3 years ago when the farewell tour was over? The documentary feels a bit outdated because you don't get to know something about how they found together for their new album again. And also all those interviews were done some years ago. Why not releasing it then? For me, the reference to their new album and the "here and now" is missing. You know these days it's about their huge comeback and in this film they just talk about the "goodbye". Strange, isn't it? But that all is nagging on a high level. Technically the Blu-Ray is top notch. The picture is great (beside the original footage from back in the days, but that's normal) and also the sound is powerful. When you see the guys rockin' out to "The Zoo", "Rock You Like A Hurricane" and other songs you just want to see them live immediately. Yeah and maybe this is what the documentary wants us to do. So, all in all this is a very interesting and honest movie about the Scorpions and every fan will be happy with it. Because of the many historical references it's even interesting for people who don't watch documentaries about Rock bands that often. Now let's see what happens in the next decades with the Hard Rock legend from Germany, because one thing is for sure: the guys are back and hungry for more!